The concept of the Americana Collection, which would house early-American manuscripts, emerged at the time of the commemoration of the DAR’s 50th anniversary in 1940. No formal collection of such material existed at the National Society prior to that time; rather, documents were dispersed among the holdings of the DAR Library and the DAR Museum. The decision was made to create a special collection to house these historic documents and other pieces the DAR had in their possession. The Americana Room is specially equipped with protective lighting, a security system, and special temperature and humidity controls, all of which are designed to provide maximum physical protection for historical materials. The Americana Collection is a manuscript collection comprised of personal or family papers, while the other collection managed by our office, the NSDAR Archives, is comprised of records generated by NSDAR in the course of business. The Americana Collection mainly consists of early American manuscripts and imprints created prior to 1830 and is home to colonial-era diaries, household inventories, samples of colonial-era currency, court records, birth and marriage records, land deeds and grants, and military papers; however, the complete collection spans five centuries. The oldest item is an English bible dating to the reign of Queen Elizabeth I and the most recent material is from the late twentieth century. Among the wide variety of documents are collections of all of the signatures of the signers of the Declaration of Independence and the United States Constitution. Today the Americana Collection contains more than 4,100 accessions. The Office of the Historian General employs professional archivists who are responsible for the Americana Collection and ensuring that the documents survive for generations to come. Archivists are trained and experienced to deal with the various questions and problems that arise in the preservation of historical documents. They are able to bring a specialized perspective and an informed interpretation to decisions concerning a document's worth and usefulness. The NSDAR archivists are currently working on a number of special projects concerning the Americana Collection including preparing a new online exhibition, coordinating an appraisal of the collection, and installing significant updates to our collections management software. As part of the President General’s Project, one of our most important ongoing initiatives is to digitize large portions of the Americana Collection. Digitization is performed in-house by professional archivists trained in the handling of historical documents and using our own flatbed scanner. Although the documents in the Americana Collection are well preserved, repeated handling exposes them to risk. Luckily, this project is not concerned with protecting a physically endangered collection; rather, the goal is to use the internet as a tool to disseminate the information found in the documents for educational purposes. The Americana Collection is available for public use and we have long sought a way to bring it to as wide an audience as possible with a minimum of risk to the documents. Digitization also gives the user the opportunity to size or excerpt a document as desired while the original remains in a secure, climate-controlled environment. One of our goals is to make the digitized documents available in one location on our website for easy access by members and the general public. Having one of our most popular and special collections, the signers of the Declaration of Independence, digitized and available online is especially important because we are so frequently asked about the signatures. 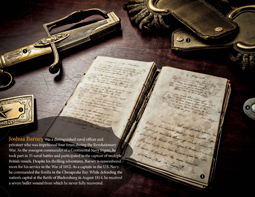 An online exhibit allows the documents to remain on permanent display without endangering the original materials. We have found much success through the online exhibits and we are looking forward to creating more in the future. 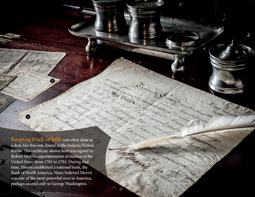 Stay tuned for our new online exhibition featuring the signers of the United States Constitution. We plan to have the new exhibit available this summer. We are always looking for ways to expand our collection and preserve our history for the future. If you have any documents that you think might fit in our collection, please consider donating them. However, before sending us these items please contact the Office of the Historian General so that we can be certain that the donation is appropriate for our collection. Any available information concerning the provenance of donated items should accompany donations to the Americana Collection. We request that donors do not attempt to repair documents before offering them to the National Society as this can cause irreparable damage to historical materials. We welcome all visitors to DAR headquarters to visit the Americana Room and our office as well. Our regular business hours are 8:30 to 4:00 Monday through Friday. If your chapter or other group is interested in a tour of the Americana Room, please contact us to make arrangements: call: (202) 879-3256 or email: historian@dar.org. You are always welcome to visit the Americana Room to view the exhibits on display, but if you wish to access any part of the collection for research purposes please call us ahead of time to set up an appointment. The Americana Collection is intended for research use both by DAR members and staff and the general public including students. You may have seen that the 2014 DAR wall calendar features documents from the Americana Collection and NSDAR Archives with beautiful photography by documentary photographer Rick McCleary. A special feature of this year’s calendar are the QR codes which link to additional content online about the objects featured in the calendar. If you would like to receive a DAR wall calendar for 2014 please contact the Office of Development at (800) 449-1776 and consider giving a gift to the President General’s Project to support the digitization of the Americana Collection. Our ability to maintain our cataloguing software, purchase archival-quality supplies, appraise the Americana Collection, acquire new items for the collections and also to provide them with adequate care—for storage, conservation, research use, and exhibits—is made possible because of the generosity that our members have shown us through financial contributions to the Americana Room Fund, Friends of the Americana Collection, the NSDAR Archives Fund and now the Young Administration President General’s Project. We are grateful and we simply could not do all of these great things without your support. We hope to see you in the Americana Room soon. In the meantime don’t forget to take a look at our exhibits online: http://www.dar.org/americana/currexhib.cfm.